According to Wumi Toriola who claimed she is a product of applaud, she will never ignore the concerns of people who watched her grow in the movie industry. She further alleged that she allowed her emotions to get a better hold of her. I am a product of Public applaud and would not at this stage ignore the concerns of the people who have watched me grow in my chosen career. 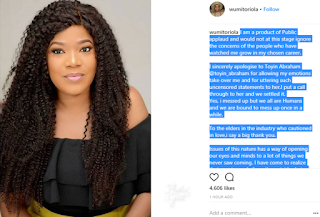 I sincerely apologise to Toyin Abraham @toyin_abraham for allowing my emotions take over me and for uttering such uncensored statements to her.I put a call through to her and we settled it. Yes, I messed up but we all are humans and we are bound to mess up once in a while. To the elders in the industry who cautioned in love, I say a big thank you. Issues of this nature has a way of opening our eyes and minds to a lot of things we never saw coming. I have come to realize that, most people from the outside derive delight in putting more fire, than quench the fire of disagreement. 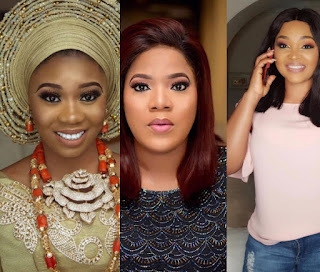 Nollywood actress, Nkechi Blessing was also in the news few days ago after she publicly apologized to Ghanaian actress Juliet Ibrahim for calling her unprofessional. She also blamed it all on being ’emotionally destabilized’. She wrote, “Dear Juliet Ibrahim my name is Nkechi Blessing Sunday. I write this to address what really went wrong yesterday. Yesterday I was very emotional and I allowed my emotions get the best part of me and I said alot of hurtful things to a fellow woman which i am not proud of so I am here to say I am SORRY to Juliet Ibrahim. Even though she said alot to me herself but that does not matter what matters is I like to let go of my hurt and make peace . I am a woman and well brought up and I should not have let my emotions get the best part of me.